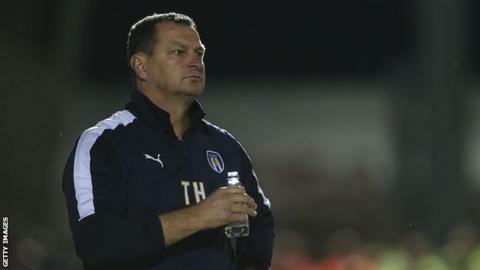 Colchester manager Tony Humes said his side got a "kick up the backside" after letting a two-goal half-time lead slip to lose 4-2 at Shrewsbury on Saturday. The U's had won four of their previous five games and moved towards the League One play-off places before the defeat. "People have said 'they're play-off contenders'. We've never said that," Humes told BBC Essex. "We've done well over the last six games. It kicks you up the backside if you don't do the basics right." He continued: "We didn't do the basics right in the second half, both defending from the front and in our own penalty box." Shrewsbury boss Micky Mellon bought on Tyrone Barnett and Sullay Kaikai as half-time substitutes with his side losing 2-0, and both went on to score a brace for the hosts. And Humes said his side are struggling with high balls into the area, after conceding in a similar manner in the defeat by Bury the previous week. "It was pretty evident at half-time what Shrewsbury had to do to get back in the game," he said. "We talked about it but we didn't cope with it. "Teams are going to do that to us - we got caught out last week against Bury. It happened again today because I think all four goals were around the six-yard box. "It was something we thought we had eradicated but it just happened too easy. "There's other sides to it as in the first half, for all our dominance, there were signs we were sloppy in possession; we didn't really keep hold of the ball in areas we should have done better."